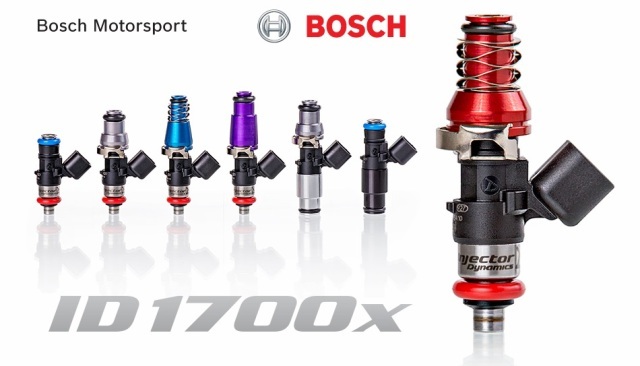 Without contest, the ID1700x Fuel Injector is the premier 1700cc Fuel Injector available. With enough flow to produce well over 3000 horsepower on Gasoline, and near 2000 Horsepower on E85 with a V10 even at 3bar fuel pressure, these can fuel just about any max-effort build. All this, without the need and hassle of setting up a Peak & Hold injector configuration on your car. Please note however, that due to their sheer size, these will likely have low idle pulsewidth instability on Gasoline, and are primarily intended for alcohol fuel mixes. -Corrosion resistant internals make it compatible with all known fuels, capable of extended service life with corrosive fuels. -Compact body allows fitment in 200+ applications, including current and future engines utilizing short body injectors. -Stronger magnetic circuit offers stable operation up to 7 bar. -Replaceable inlet filter extends service life. These injectors are supplied with extenders that will allow fitment as a 48mm injector, or without them, as a 34mm Injector. This is equivalent to a Gen-4/5 injector length with adapter, and a Gen-3 without adapter. 60mm top extender also available on request.